I CAME TO SOUTHWEST FLORIDA from New England for one reason: winter. It was one particularly brutal January that did me in — temperatures fluctuating from 50 above to below zero with three feet of snow. A week in Southwest Florida sounded about right. I booked my trip, grabbed my fishing gear, and off I went. Ultimately, off I stayed. Over the years, I’ve grown very fond of the region. It’s relaxed and naturally remote, but with a good mix of creature comforts thrown in. 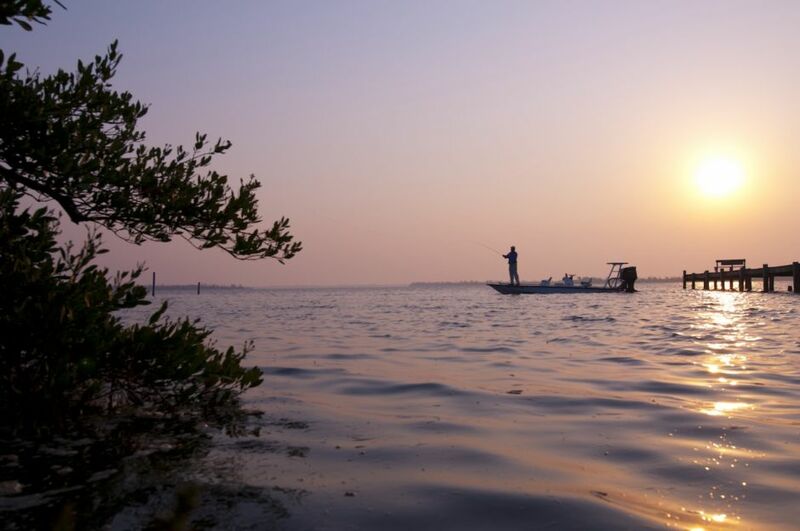 And the fishing… Fishing in Southwest Florida is whatever you want it to be, practically wherever you want it to be. Anglers like myself can walk the beaches and sight fish, or work the inland waterways, flats, and mangroves. Whether you go by boat or go by boots, pick a spot from the list below, and the rest is up to you. This one is numero uno for a reason. Sanibel Island’s 7,600-acre J.N. 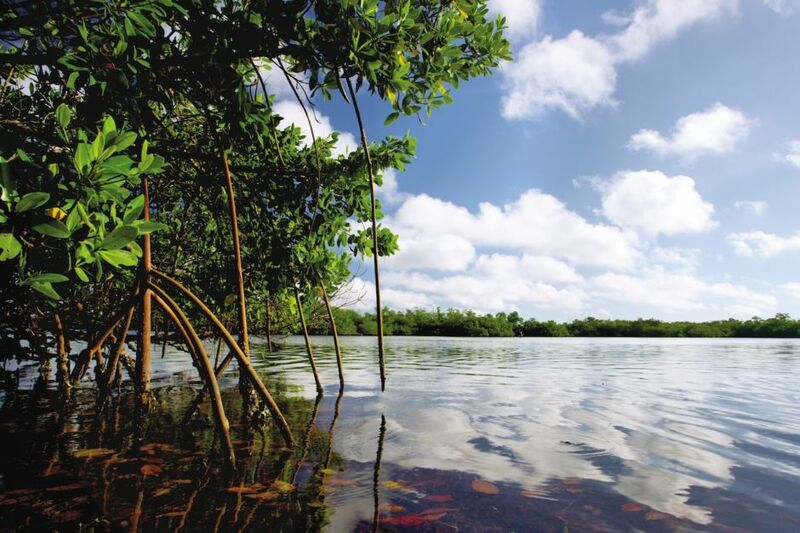 “Ding” Darling National Wildlife Refuge is among the largest conservation areas in the country devoted to mangrove preservation. It’s a labyrinth of creeks, bayous, grass flats, and oyster bars, and its complexity and beauty is mirrored in the sport. We’re talking about a virtual baitfish factory — big fish eat little fish, and you’ll catch ’em both up here. The Wulfert Flats zone near the northwest corner of Ding Darling doesn’t allow combustion engines. Only poling or trolling is permitted, and since no props or skegs dig up the bottom, the fishing is further improved. Set out from Blind Pass, where Captiva meets Sanibel — kayaks can be rented from the Beach Cottages of Sanibel to get you started. Don’t just race to Wulfert Flats, though. Along the route are a number of flats, channels, and oyster beds, all of which hold fish. The species vary depending on the water temperatures and time of year, but you’ll find excellent numbers of snook and reds. Spotted sea trout, tarpon, jack crevalle, and tripletail are frequently mixed in as well. 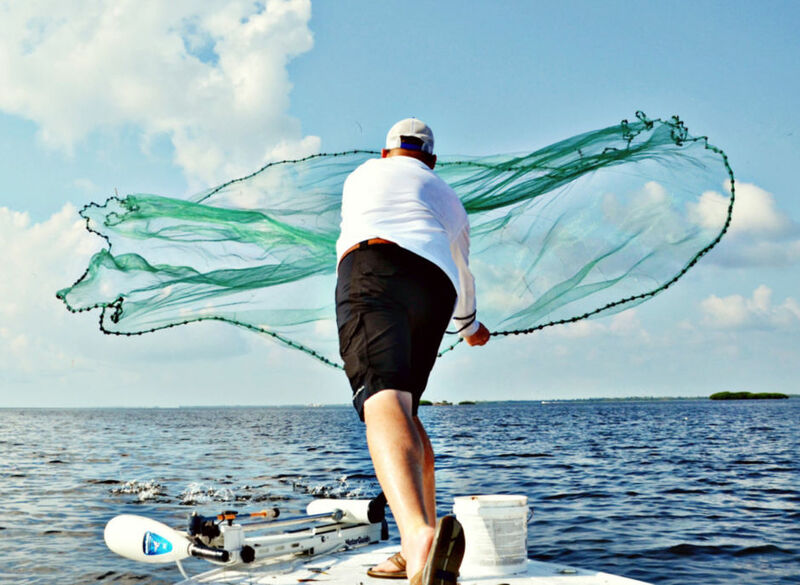 While you’re in the national wildlife refuge, head over to Tarpon Bay — where there’s more than one way to catch a fish. The easiest is to fish in the channels running along the road that cuts through the refuge. Here you’ll find sea trout, redfish, snook, and mangrove snapper. The beauty of this style of fishing is it’s so convenient, anglers have no excuse for not giving it a go. But its simplicity entails another fact: Pressure can be significant. If you don’t pull in a satisfactory catch here, coming home empty-handed feels all the more bleak. Luckily, that doesn’t happen too often. If you need to get away from the crowds, rent a kayak. Tarpon Bay Explorers is conveniently located for an easy departure — launch your ‘yak and paddle away. Tarpon Bay came by its name honestly, and you’ll find plenty of tarpon cruising the channels and moving up onto the grass flats. Small-to-medium-sized fish are most common, but they’re the best, too. The fights aren’t epic two-hour deals like with giant tarpon, so you can walk the smaller fish through a bunch of jumps and runs and then hook another before the school pushes on. Check out the deep holes and grass flats for other fish like cobia, jacks, triple tail, and the occasional shark. The flats range from two to five feet in depth, and the flood tide fishes best. Occasionally you’ll find some Spanish mackerel running the channel edges, too. The small, frequently overlooked Buck Key Preserve is across the channel from the ‘Tween Waters Inn Island Resort & Spa. An organized kayak trail runs through Buck Key’s mangrove tunnels, and while there are snook and baby tarpon in the roots, the tight canopy calls for conventional or spin tackle. The flat at the north end of the preserve hold reds and trout, and since it’s open it can be fished with any kind of tackle, including fly. Channels on the east side of the key hold cobia, tarpon, and snook; look for reds as they move up onto the adjacent flats. The lagoon on the west-central side of Buck Key is good, too. Concentrate on the mouth on the dropping tide and move into the lagoon on the flood. DIY-ers can rent 19-foot Palm Beach center consoles powered by 115 HP outboards from Beach Bums Boat Rentals. The fishing destination is Cabbage Key, an undeveloped 100-acre island. There are no roads, no cars, and no shops on Cabbage Key, but there’s one restaurant called the Cabbage Key Inn and Restaurant. 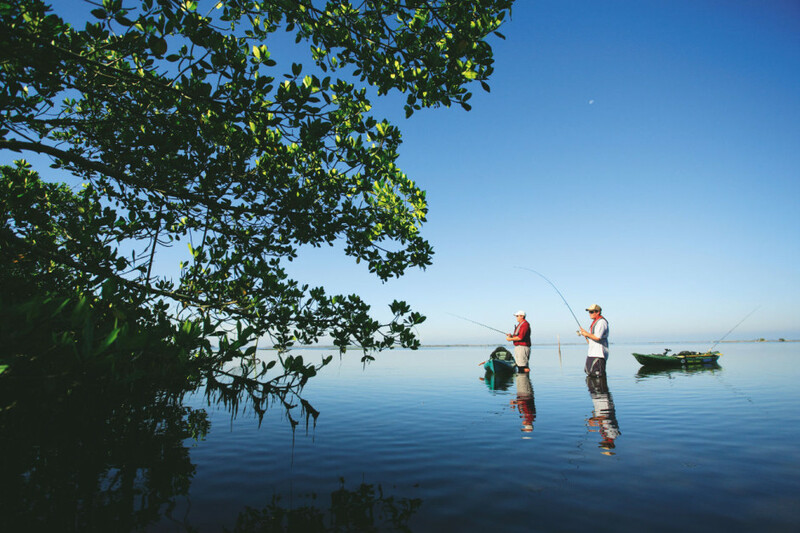 It’s the only game in town, and you might get hungry from wade fishing the pristine beaches for cruising snook, tarpon, and reds. Rising tides are good, but if the fish aren’t in, explore the surrounding mangroves, flats, and channels. If you don’t want to rent a boat, there are multiple water taxis available to the island. 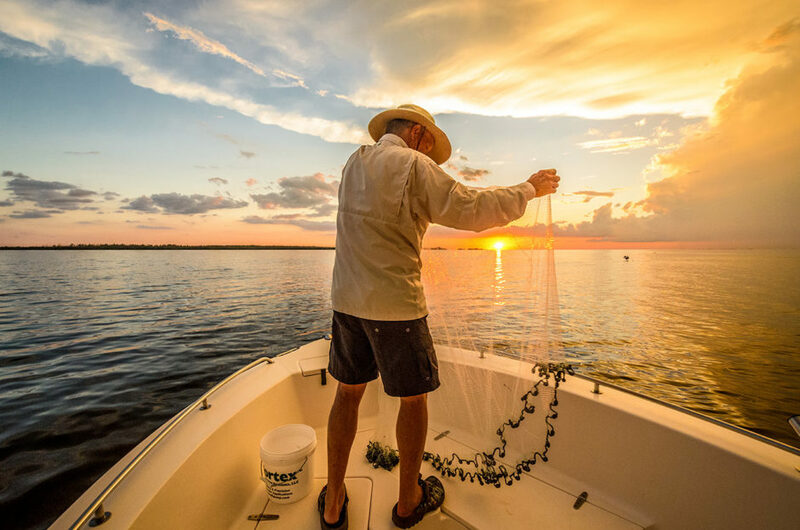 Check out Captiva’s South Seas Island Resort, which offers water shuttles to Cabbage Key and provides an excellent base of operations for exploring — and fishing — the area. Any fishing trip to Southwest Florida should include this spot. The 15-square-mile Estero Bay runs from Naples to Fort Myers and is fed by 10 different river systems. Here you’ll find some of the best shallow-water fishing in the state. Sea trout and reds are on the flats; snook, drum, and trout scour the grass beds; and sheepshead and mangrove snapper are along the oyster beds. Look for jacks, tarpon, and barracuda in the channels. You’ll find fish to catch at just about any phase of the tide. If you want to rent a boat or hire a guide, look out for Fishtale Marina — they have more guides than you can shake a pole at. If you’re on the north side, hit up Pink Shell Beach Resort and Marina. With their guidance, you can spend more time fishing and less time motoring. If you didn’t bring gear but want to get in a quick fish, rent tackle from Salty Sam’s Marina or Estero River Outfitters. When you find yourself on or near Periwinkle Way on Sanibel, Whitney’s Bait & Tackle or the Bait Box are good options, too. Fly rodders can try Norm Ziegler’s Fly Shop on the same street. Last but certainly not least, head to the fishing pier by the Sanibel Lighthouse. This area is best for spin and bait fishing, and you’re bound to catch something here. That said, it can get crowded. The best thing to do — and it’s ideal if you’re a fly rodder — is to hit the sand. Start at the light and work your way along the beach down to the Sanibel Moorings Condominium Resort. 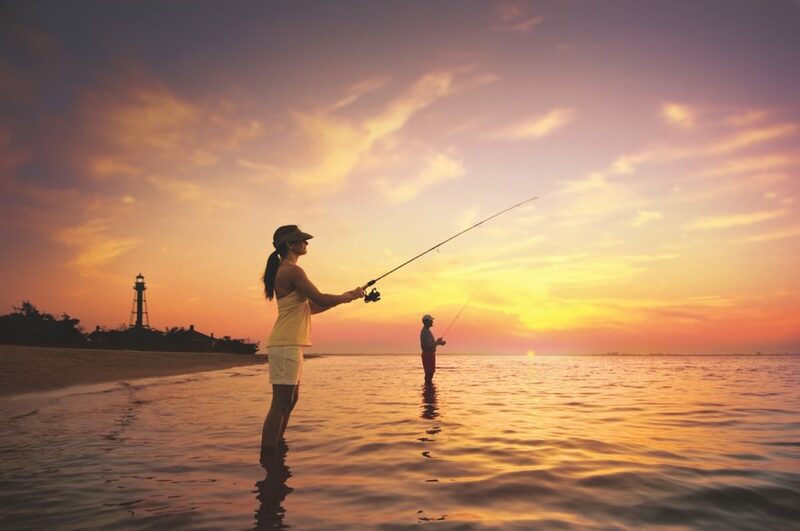 Along the beaches, you’ll find good to great snook fishing, particularly in low-light conditions. These snook run tight to the beach, making them perfect for fly rodders or spin fishermen. East winds break up the surface just enough so the fish are less spooky. Bright sun makes snook skittish, so daytime isn’t as productive as early or late light. It’s all sight fishing on the beaches, and sometimes you’ll find Spanish mackerel, pompano, ladyfish, and the occasional tarpon or redfish. Know that vacationers make their way out onto the sand between breakfast and cocktail hours, but you’ll have miles to walk before they arrive or after they depart. And there’s plenty of sand and lots of fish west of the condos where you can have the beach practically to yourself.